Meagan Martin : Dress for Success! In light of the upcoming competitions that I will be attending, I thought it would be fun to write a post about how to prepare for a competition. It is common for athletes to open up about their training secrets before major competitions, but I would like to focus on a subject that is a little lighter. As a former pole vaulter and gymnast, I can attest to the effort that women put in to looking their best in competitions. It may sound like a silly topic, but it is one that high-level athletes in many different sports take into account when they are getting ready to compete. If you look back at the last Olympics the proof is there, because the majority of the women made it a point to not only perform at their best, but also look their best. 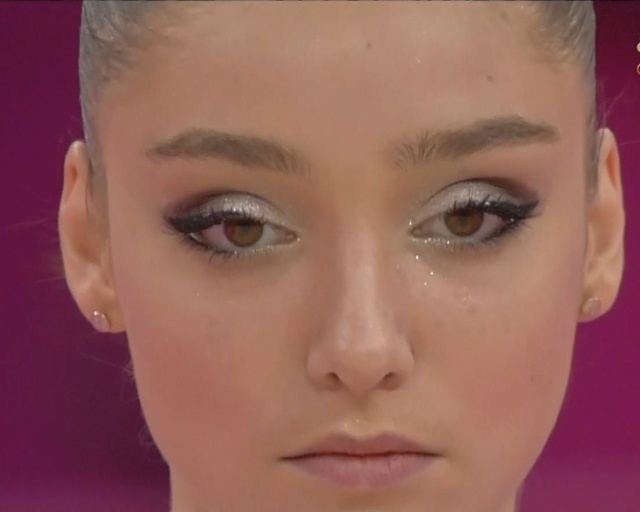 Alyia Mustafina looking fierce and focused! Make-up may seem like a superfluous thing to worry about while competing, but the majority of female athletes wear it when they compete. Aliya Mustafina of Russia was full of sparkles with her eye-popping eye shadow, which made her even more noticeable as she prepared to salute the judges before each of her events. In my opinion she looked amazing, but when it comes to eye make up I prefer to go a little simpler. If you are going to go for a dramatic look on your face it is important to choose only one area to make a statement with. Mustafina was spot on when she chose to focus on her eyes, and went for the simple and natural look on her cheeks and her lips. This made her face look flawless and not too overdone. For climbing I like to put on a little mascara and some Maybelline baby lips Chap Stick, that is my go to look, but every now and then it is nice to go for a more dramatic look. 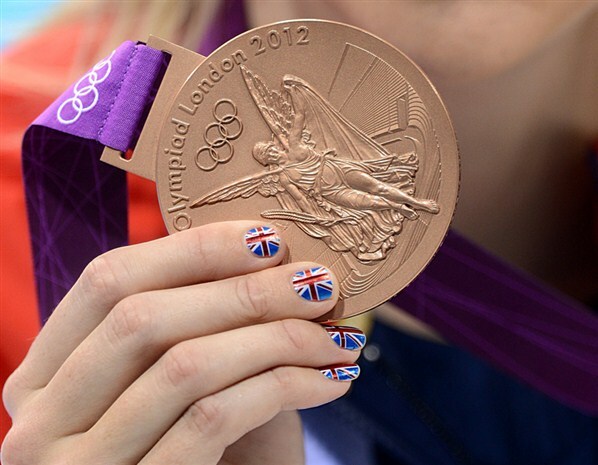 Rebecca Adlington's creative nail designs are perfect for any competition. Nail polish is probably one of my favorite things when it comes to beauty supplies. Today it is common to see not only bright and crazy colors, but also really cool designs. I always paint my nails before a competition, not only does it relax me, but it also takes my mind off the stress that comes with thinking about a competition. It is also a great way to express your creativity, or even represent your country. Great Britain’s Rebecca Adlington chose to put the British flag on her nails during the Olympics and she totally nailed it! As long as your nails are too intense to distract you from the task at hand I say the more creative the better. 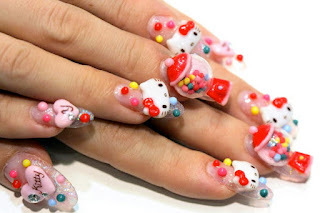 I am extremely partial to Hello Kitty, but 3D nail designs are best to avoid when it comes to competitions. When it comes to hair, the most important thing to consider is how to keep it out of your way. The last thing you want to happen is to have your hair keep you from doing what you need to do, because after all you are there to do the best that you can do. I am personally a big fan of braids; they look nice and they seem to stay put. Ponytail braids happen to work best for me, especially if I am sport climbing. 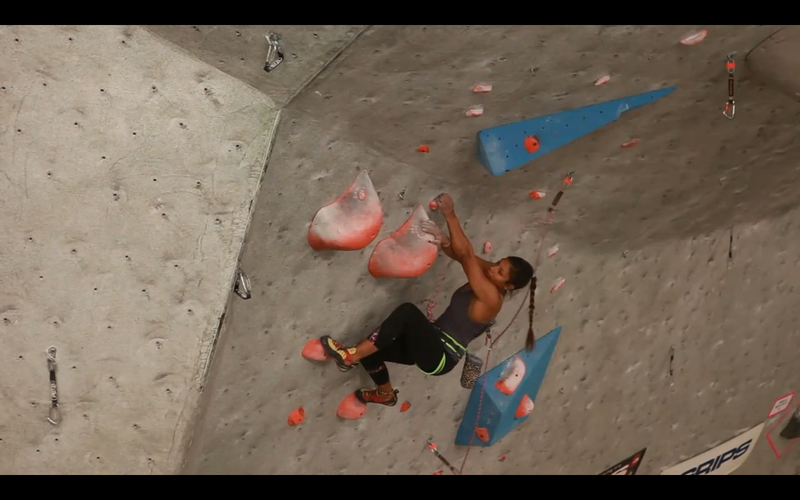 It is important to take into account how long your hair is, because if it is too long there are certain hairstyles that won’t work if you are wearing a chalk bag, because your hair can literally end up in the bag when you look up at the holds on the route or problem. Braids seem to be a trend amongst most athletes as well, for example, Jennifer Kessy and April Ross rocked the ponytail braids while they were kicking some tails on the court. 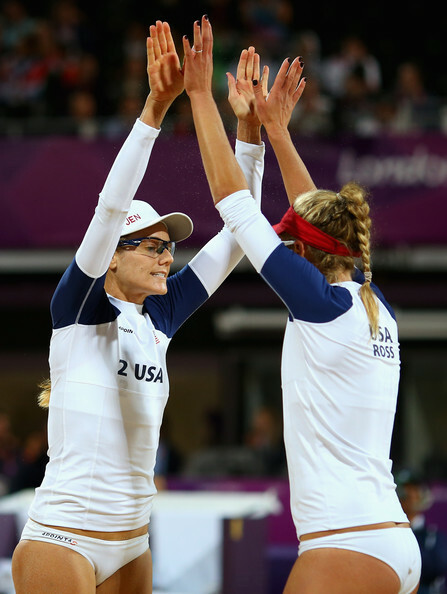 Jennifer Kessy and April Ross celebrate while sporting the classic ponytail braid. When it comes down to it doing your best in a competition is obviously the most important thing, but it doesn’t hurt to look your best too! I chose to wear a ponytail braid during qualifiers at SCS Nationals. I loved the way it looked, and it never got in my way!